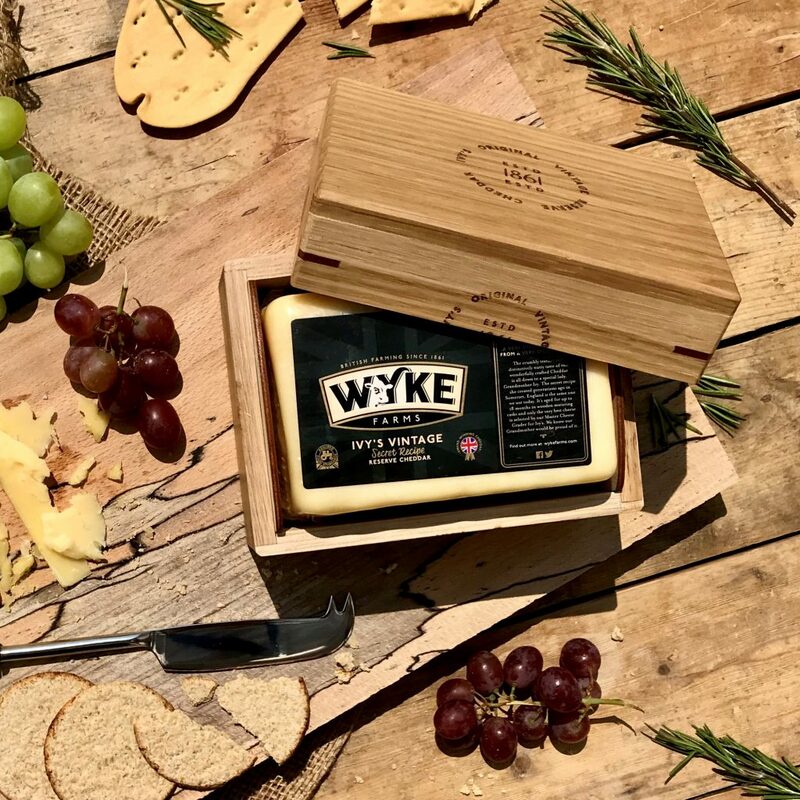 Bruton, Somerset, 18th July 2018 – Wyke Farms, the UK’s largest independent cheese producers and producers of renewable energy, announce their new gift box; a uniquely crafted Ivy’s Mini Maturing Gift Box, housing a 1.25kg pack of their Ivy’s Vintage Reserve Cheddar. This year, the Clothier family at Wyke Farms are set to make sharing Somerset’s original Cheddar cheese easier than ever with the Ivy’s Mini Maturing Gift Box, made from sustainably-sourced oak, and a mini replica of the wooden boxes used to age the cheese in Wyke Farms state of the art Maturing Store. Over the years the traditional methods used by Ivy and her husband Tom haven’t been lost in the gleam of stainless steel. The Cheddar at Wyke Farms is still aged in wooden maturing boxes and constantly monitored by their Master Cheese Grader to ensure a delicious taste and guaranteed quality. Ivy’s family founded Wyke Farms in the 1800s and now, three generations later, the Clothier family continues to use her celebrated 150-year-old recipe for turning their fresh milk into award-winning cheese with perfect texture and exquisite taste. Fresh milk is collected daily from Wyke’s local farms, where the cows are grazing the lush pastures in the heart of Somerset, the milk is then made into Cheddar at the dairy near Bruton. The Ivy’s Vintage Reserve Cheddar then goes through a careful maturation period, for no fewer than 18 months, under the watchful eye of the Master Cheese Grader. The traditional art of cheese making is maintained at Wyke Farms as the skilled cheese maker carefully brings all of the ingredients from the lush pastures of the Mendip Hills into full development of taste and texture. Available to purchase from Wyke Farms Farm Shop, Bruton, Somerset and online from: www.wykefarms.com/shop from September 2018 – December 2018.